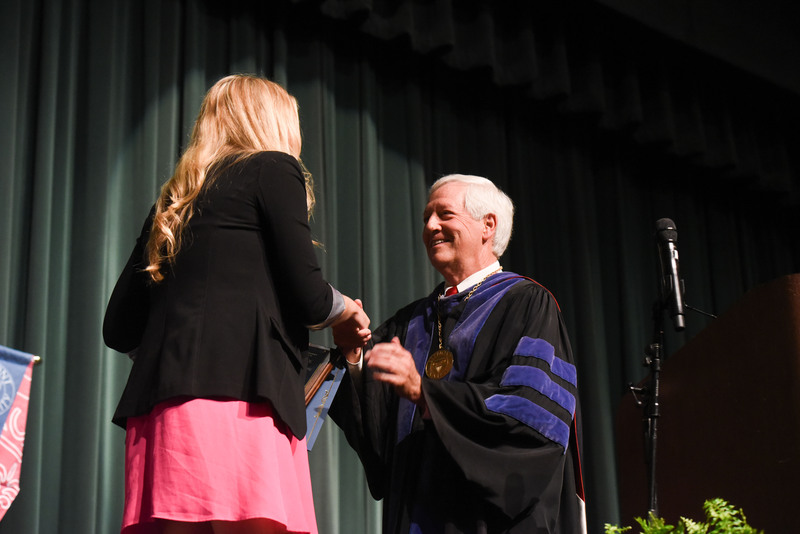 Belmont’s highest achieving students and faculty were honored for their commitment to the University’s mission and dedication to scholarship, service and leadership at the institution’s Scholarship and Awards Day convocation in the Massey Performing Arts Center on Wednesday. Associate Professor of Economics Dr. Marieta Velikova, the 2015-16 Chaney Distinguished Professor, gave the ceremony’s Honors Address and discussed the power of education, likening it to a springtime harvest. Quoting a Chinese proverb, Velikova described the gifts of each of this year’s Chaney Award nominees, detailing their unique gifts and the ways they contribute to the Belmont community. In addition to student award winners, a number of awards were given to faculty members. The Christian Scholarship Award honors faculty scholarship that engages the Christian intellectual tradition and advances the scholarly conversation between Christian faith and learning. This year’s recipient was Assistant Professor of English Dr. Jayme Yeo. The Leadership in Christian Service Award honors faculty who provide leadership to a new initiative or an established Christian organization that serves those in need. This year’s recipient was Dr. Jamie Adam, associate professor of nursing. The Faculty Award for Scholarship recognizes a faculty member for outstanding intellectual and creative contributions of discovery, integration, application or teaching. This year’s recipient was Professor of Physical Therapy Dr. Nancy Darr. Dr. Christopher Norton, School of Music, was awarded the 2015-16 Presidential Faculty Achievement Award. The Presidential Faculty Achievement Award is presented each year to a faculty member who has made outstanding contributions to student life outside the classroom. The award honors and recognizes excellence in faculty-student relationships, special abilities in meeting student needs – academic, personal and professional – and symbolizes Belmont University’s commitment to being a student-centered institution.